The end of December is a bizarre time of year. So many people are busily stuffing themselves with all the cake and candy they can manage, while making heartfelt plans to completely overhaul their diet and exercise routines as soon as January 1 rolls around. Paleo holidays don’t have to include the traditional sugar-fest, of course, but many people still like to join in the tradition of resolution-making. It’s common to make fun of New Year’s resolutions as nothing but a meaningless tradition – starting a new diet in January only to quit after a month is almost a cliché. If something is important enough to change, why not change it immediately, instead of waiting for some arbitrary date? These are certainly legitimate criticisms, but on the other hand, many people see January 1 as a “fresh start,” that one final push they need to make a significant lifestyle change. Others like the social aspect – self-improvement is more fun with a group, even if it’s just a group of friends commiserating about how hard it is to keep their resolutions. Every regular gym-goer knows the “January Joiners.” These are the people who swear to “get in shape” on December 31, and then buy a gym membership full of good intentions. On January 1st, they arrive at the door with their brand new running shoes and earnestly set to work burning off the holiday season’s indulgences on the elliptical machine. They come for two weeks, maybe three – and then disappear back to the couch. Joining a gym and then quitting can have several different reasons, but a huge number of people fall into this trap every year for the same reason: they make bad resolutions. Bad resolutions are very vague (“I want to lose some weight”), absurdly overambitious (“I want to run a marathon in February” – from an overweight diabetic recovering from knee surgery), and have no specific plan attached to them (“I want to eat healthy”). Bad resolutions are things you think you ought to change, not things you really want (“my mother says I should stop smoking, so I guess that’s my resolution”). 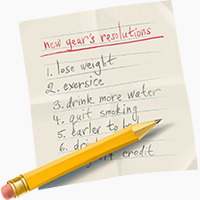 Bad resolutions usually travel in packs (“I want to save money and eat right and get in shape and learn Japanese…”). Bad resolutions are all but impossible to keep – so don’t make them! Good resolutions, in contrast, have several distinctive characteristics, no matter what they’re about. Whether you’re resolving to read more books or lose your spare tire, good resolutions have several things in common. Your New Year’s resolutions aren’t about what your mom, or your grandmother, or your husband wants from you. If your resolutions all start with “I should,” chances are you’re feeling outside pressure to do something – you know you ought to do it even if you don’t want to, so you make a resolution and hope it sticks. Unfortunately, it probably won’t stick. Making positive lifestyle changes is very hard, and involves fighting through a lot of challenges. Keeping your resolution on January 1 might be easy – it’s new and exciting, and you’re all fired up to change yourself. That’s great! Keeping your resolution on February 1 isn’t going to be that effortless. By then, you’ve lost that initial enthusiasm – you’re back on you’re your regular schedule after the holidays and realizing exactly how much effort is involved in sticking this out for the long haul. If you have no intrinsic motivation to keep to your resolution, this is when it will fall by the wayside because you “just don’t have time” or “can’t afford it,” or simply stop caring. You never really wanted it in the first place, so your drive to follow through falls apart at the first sign of a serious obstacle. This isn’t a sign that you’re weak or lazy. It’s nothing but an illustration of basic human psychology – you can’t commit yourself to someone else’s goals. To avoid this trap, make sure that your resolutions are coming from you. Do you want it, or are you just doing it to make someone else happy? Do you care? Do you feel an inner drive to follow through? Why? Post notes or pictures in strategic places to remind you of your motivation at key moments. For example, if you really want to get your spending on track so you can save for a really fantastic summer trip, try taping a picture of your destination to your credit card, so every time you pull it out, you’re reminded of why you need to use it carefully. If you have a vague, shapeless resolution, it’s completely natural to start watering down your initial commitment, or justifying yourself for scaling back your effort. If your resolution is “I want to exercise more,” it’s easy to talk yourself into believing that cleaning the house counts as a workout so you don’t need to head to the gym. It’s easy to exercise on Monday and then leave it for the rest of the week (after all, you are exercising more, and you never specified how much more!). If your resolution is, “I will go to the gym 4 times a week” or “I will run at least 20 miles per week,” it’s much more difficult to make excuses for yourself. This keeps you accountable to your goal. Specific goals also make it possible to track your progress accurately. Unless you have a quantifiable goal, how will you know when you’ve succeeded? How will you hold yourself accountable for “eating better” if you don’t have a specific diet plan that you’re trying to follow? Your resolution should almost certainly have some kind of number in it. As you work toward accomplishing the resolution, keep a written record of your progress toward that number (pounds lost, miles run, days worked out, etc.). This is not only a useful tool, it helps keep you encouraged it you have one bad day, because looking back at the long record of your achievements can really put a setback into perspective. Whatever your plan looks like, it should include what (specifically) you plan to do, when (specifically) you’ll do it, and how you’ll make sure it happens. Set yourself up to keep your resolutions by planning ahead for obstacles. This will also help you make sure your plan is actually doable. If you’re struggling to figure out how you could cram in two hours of yoga every day on December 31, imagine how tough it’ll be to actually make it happen in the midst of a hectic workweek. Making a specific plan will help you keep your resolutions reasonable. When you’re in a self-improving mood after Christmas, it’s tempting to try to change everything at once. But this is a bad plan for long-term success because it’s too overwhelming and dilutes your focus into a hundred little things. Instead of trying to change everything at once, pick one resolution – the one you care about most – and focus on that for a month. Then, if you feel settled and stable in your new routine, you can think about adding another change. If you don’t, it’s fine to keep focusing on your first goal. It’s better to change one thing for good than to change ten things for a week and give up on all of them! Finding some way to hold yourself accountable for your resolutions is a great way to help yourself. Try finding a buddy interested in making the same resolution, so you can both check up on each other and keep each other on track. Even if you can’t find someone to jump in with you, tell your friends and family about your goals, and enlist them in helping you stay on track. This harnesses the power of social pressure to help you. If you’re the only person who knows about your resolution, it’s all too easy to give up and distract yourself from feeling bad about it. But if you tell everyone you know, you’ll have to admit to all of them that you gave up, and the potential embarrassment of conceding defeat can help keep you on track when willpower alone won’t cut it. Your friends and family can also help you with positive support (for example, by not offering you foods you’re trying to cut back on). It’s hard enough to change any significant lifestyle factor; enlist all the help you can get. 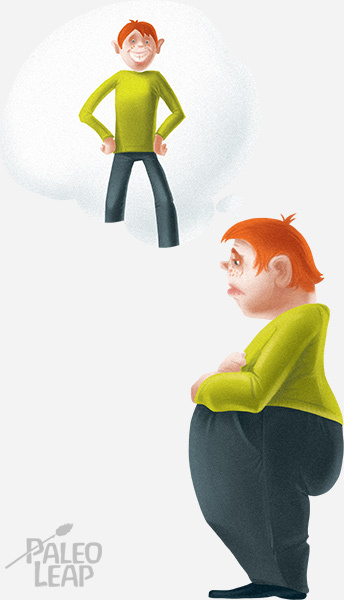 Weight loss is the traditional New Year’s goal, but many people have already lost the weight they wanted to lose, didn’t have any weight loss goals to begin with, or are just sick of making resolutions about it. The 10 Paleo resolutions below are weight loss-unrelated: try adopting one of them, or use the list as inspiration for your own. Grass-fed meat is not only a more ethical choice, but much better for your health and even more delicious. American factory farms (technically known as Concentrated Animal Feeding Operations, or CAFOs) pack animals together under inhumane conditions. In such crowded living quarters, the animals need massive doses of antibiotics just to stay alive – antibiotics that then get passed down to anyone who eats them. The nutrient content of the meat is also lower from animals who eat human-engineered feed (designed to make them grow bigger, faster), rather than their natural diet. Both of these problems make switching to grass-fed meat one of the best ways to improve an already solid Paleo diet. Exactly the same argument goes for wild-caught fish. If you can’t afford to switch entirely, try committing to a certain number of pounds per week, or a certain percentage of your weekly meat intake. Every little bit helps, so don’t feel discouraged if you can’t go all-out, all the time. Getting enough hours of quality sleep every night can make the difference between vibrant good health and a chronic case of the blahs. Sleep deprivation is a major contributing factor to chronic stress, insulin resistance, weight gain, depression, and overall misery. If you’re already eating Paleo but still not feeling your best, it might be time to take a long hard look at your sleeping habits: you can tweak your diet to perfection, but if you’re skating by on 5 hours a night, you still won’t feel as energetic and healthy as you could. To make this resolution stick, make sure to give yourself an explicit bedtime. “I will get enough sleep” is vague, making it easy to convince yourself that you aren’t tired yet, so it’s OK to stay up another hour. Pick the time when you need to be in bed to get a solid 8 hours, and then commit to turning off all your screens (computer, TV, and phone) 1 hour before then. Even though Paleo allows for an almost infinite variety of meals, it’s definitely possible to get stuck in a rut. Especially if you don’t have a lot of time to cook, it’s much easier to just roast a big pork shoulder on Sunday and eat leftovers the rest of the week – who has time to cook a photogenic three-course meal every day? This is time-efficient, but gets boring after a while, and when you’re bored with your diet, you’re much more likely to give in to the temptation to eat something off-plan. A new recipe doesn’t have to be a masterpiece of culinary perfection. Just putting a different mix of spices on your chicken, or preparing the same vegetable side in a different way can add an interesting twist to your meals and make Paleo more enjoyable to stick with in the long term. To help you stick to this resolution, try picking out a specific time for your experiments. Weekends are probably better for most people, but pick a day that fits into your schedule. It doesn’t have to be dinner, either: experimenting with Paleo breakfast ideas can be an interesting start to the day, or a series of new lunch recipes can liven up a workday afternoon with something tasty and new. A CSA (Community Supported Agriculture) is exactly what it sounds like: a farm that allows local residents to buy directly from the farmers. In most CSAs, you buy a “share,” which entitles you to a certain amount of produce every week for an entire farm season. CSA shares vary widely in price, depending on the amount of vegetables and your location, but they’re almost always cheaper than organic produce from a grocery store, and usually even better in nutrient quality, because they’re local as well. Many CSAs also allow members to work on the farm, which is a great way to meet other people who care about quality food, and to give kids a chance to see where their dinner comes from. Having an automatic veggie delivery can help you include more nutrients in your diet, and give you inspiration for all kinds of different recipes with veggies you’d never think to buy at the store. Coffee is a blessing and a curse to the modern world. On the one hand, it gives us that quick boost of energy we need to power through a tough Monday morning, or a late night of studying. On the other hand, the constant presence of stimulants like caffeine makes it easy to deprive ourselves of real rest and just rely on coffee to make up for the hours we didn’t spend in bed. Without caffeine, we wouldn’t be able to keep up with the modern culture of nonstop effort, but without caffeine, that culture couldn’t exist in the first place. There isn’t any serious health danger from a cup of coffee, but if you’re consistently relying on a caffeine high to stagger through to the end of your workday, it’s time to take a step back and reassess. This can be quite unpleasant (caffeine is an addictive substance, and the withdrawal isn’t fun), but ultimately it’s much healthier to get enough sleep than to just hide your fatigue with coffee. Try cutting down slowly, one cup at a time, until you reach a sustainable, healthy level. To help you keep this resolution, you might want to stock up on tea to satisfy the desire for something warm and tasty to drink. You could also try saving all the money you would otherwise spend on your coffee fix, and then using it for something really fun at the end of a month or two. Far from needing more exercise, many serious athletes are in danger of over-exercising – training too hard and recovering too little. If you expect your body to keep performing at a high level for years to come, you need to take care of it, and that doesn’t just mean stretching when you’re done with a workout. Recovery means a date with the foam roller twice a week, a commitment to icing and resting, mobility exercises, and all the other care your body needs to properly bounce back after you push yourself to the limit. Consistently committing to taking proper care of your body will help keep you performing at a high level and injury-free for the long term. Like other resolutions, this one needs a specific goal – try committing to two 30-minute recovery sessions per week. Icing and stretching doesn’t have to demand all your attention: you can do it while you’re watching a movie, or turn it into social time with friends or family. Stretching and relaxing also makes a great wind-down activity at the end of the day, or as a brief break from a tense situation wherever you are. 7. I will spend more time in the sun. Spending a little more time outside every day isn’t just relaxing. It also helps you get enough Vitamin D, an essential micronutrient that too many people are deficient in. While it’s possible to get some Vitamin D from food, the best source is sunlight. A brisk walk on your lunch break is doable even in cold weather, and the exercise can help get your blood pumping and wake you up for the rest of the afternoon. As always, make sure to phrase this resolution as a specific, quantifiable goal. “I will go outside for a walk every day at 11am” is much more likely to succeed as a resolution than “I will get more sun.” Even if you can only commit to sun exposure on the weekends, it’s still a great habit to get into. 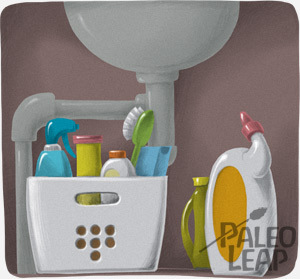 Common household chemicals, like dish soap and odor removers, often contain all kinds of harmful environmental toxins, from dioxins to BPA. Replacing these dangerous chemicals with more human-friendly versions (or simply forgoing them altogether) can save your body from all kinds of damaging chemical exposure. This is especially important if you have pets or small children in the house. For a specific action plan, you could resolve to do this in two different ways. Either you could slowly replace all your old products as you run out of them, or you could throw everything out all at once and start fresh. Which plan you make will depend on your financial situation and your own personal preferences. Either way, set yourself a timetable, and make a list of human-friendly cleaners to buy, so you aren’t stuck in the grocery store wondering what all the labels mean. The personal automobile might be responsible for much of the high standard of living in the modern world, but it’s also responsible for countless hours of hunching over a wheel under fairly intense stress every day. From a Paleo point of view, this makes driving very dangerous in ways that have nothing to do with accidents: even if nothing goes wrong, you’re subjecting yourself to a kind of chronic stimulus that you just weren’t designed to handle. Spending a whole day without driving anywhere might seem impossible, but this is just because most people are so used to driving that they never consider the alternatives. Look around your area for public transit, walk to and from the places that you need to go, or buy a $20 bike at a yard sale and enjoy getting to know your neighborhood in a different way. Driving is isolating and stressful; not driving can help you connect to the people around you and keep your body moving in the process – two substantial health benefits even before you factor in the heart attack at the price of gas. …or the Appalachian Trail. Or run a Tough Mudder. Or deadlift twice your bodyweight. Whatever it is, set an ambitious fitness goal that you’ll train for during the next year, and then decide on a few mini-goals to make sure you’re still on track as you work toward your grand finale. Maybe you could make a resolution to run a marathon by next December – and then enter yourself in a 5k in April and a 10K in September, to give yourself constant motivation to keep training and improving. Having a bold, challenging goal will keep you motivated to work out by giving you an actual reason for doing it. Nobody cares about burpees for the sake of doing burpees, but those burpees get you closer to your goal of climbing Mount St. Helens, they suddenly become much more important. Set your goal, and then cook up a workout plan to get yourself there – and keep track of your progress throughout the year. This year, don’t resolve to “get healthy” or “start eating right” or “be better with money.” Resolve to eat at least 4 servings of vegetables per day, try liver recipes until you find one you like, or save $50 per week. These specific, goal-oriented resolutions are much more likely to stick in the long term, especially if you enlist a buddy to keep you accountable and regularly track your progress to make sure you’re still on target. It’s fine to make only one resolution, instead of a whole list – in fact, it’s actually preferable, since this lets you focus on just the one change, rather than scattering your energy all over the place. It’s fine to not make a resolution at all, but if you do, pick your battle carefully, and commit to it in a way that will help you get there.